It’s a surreal experience, sipping your breakfast coffee at a table where some of the most brilliant minds in ecology are chowing down on sausage and eggs while gleefully recounting scandals in Canadian politics (there are, apparently, a number of these). No matter how many conferences I attend, I am always a bit shocked to discover that generators of fundamental theorems, the authors of Science papers and the case studies in my textbooks are actual flesh-and-blood human beings. People with personalities and foibles, but also scientific minds that, unlike their journal articles, offer the opportunity for interaction and discussion. At the Predator-Prey Interactions conference this last week, there were plenty of brains for me to pick and researchers for me to pester – they put up with it rather well, and the experience offered my great insight into where the field is going and how to tackle the next big ideas in fear and the indirect impacts of predation. Above is a copy of the poster I presented: I may have described it to someone as containing “idea vomit.” So, I’m going to have to work on that phrasing, but essentially what it contains is a splurge of all of the questions I want to answer, variables I think I worth investigating, and the methodologies at my disposal that could be used to dig down into the core of these issues. Over the course of the week, with its deluge of presentations, posters, workshops, meetings, and the occasional poolside chat, this splurge became refined into a more coherent and plausible set of research objectives. Okay, so, that may be a bit of a wistful exaggeration. What actually happened is that I received a million suggestions, compiled a list of literature to read that will keep me busy for the next few months, and met a number of interested and informed people who will certainly be useful resources as my research progresses. Great ideas for the course of my research certainly did come out of this conference. Our system has the major advantage, of course, of the massive camera trap grid and the extensive duration over which the project has been running – no one else has this quantity of information. 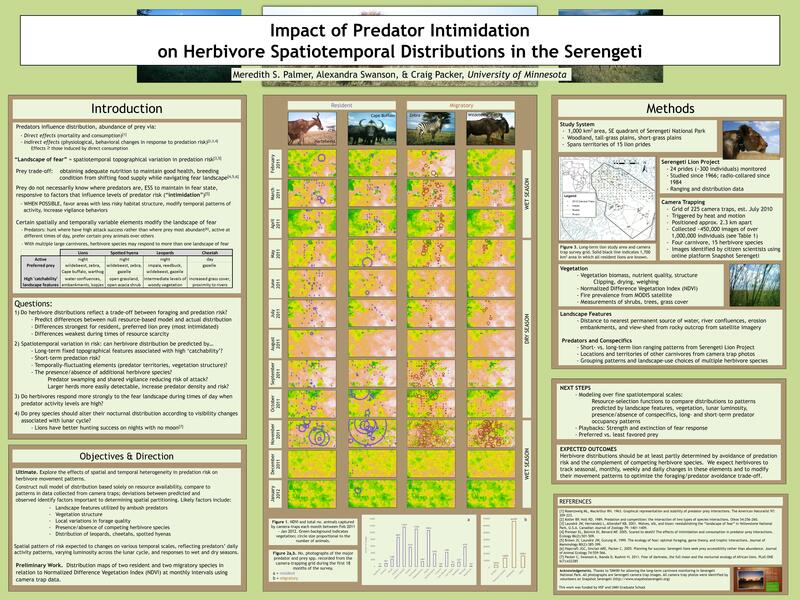 As you can see on my poster, I can use this data to map out the distributions of herbivores on different time scales and then overlay features (here, a “greenness” index of vegetation) to get an idea of what is attracting or repelling herbivores to different places at different times. This method is extremely useful and often employed by people constructing landscapes of predation risk. However – something that would be informative to do, I learned, would be to ask the animals themselves exactly where they feel safest or most as risk. I don’t mean passing out surveys, but I certainly became excited about incorporating a larger manipulative element to my study. I had already planned on blasting predator calls around camera traps to see who responds (flees!) and how long it takes for their fear response to go extinct. We can look at this over the long-term using the camera traps. Now, in addition to playing predator calls, I am also interested in obtaining alarm calls from a variety of herbivores to broadcast, which may also shed light on coexistence mechanisms for different herbivore species. If anyone knows where I might be able to snag some audio recordings, let me know! Another methodology to utilize would be examining “giving up densities” (GUDs). To determine a GUD, feeding trays are set up in different areas around the study site containing food (delicious) mixed into an inedible substrate (like corn cobs, or chunks of PVC piping). The idea is that initially, it’s fairly easy to extract food from the matrix when there’s a lot of it, but over time, you get less and less food return for grubbing around in the PVC. If you don’t feel safe in a particular location AND you’re not extracting enough food to make it worth your while, you should give up and move along sooner than if you were more comfortable in a safer area. The amount of food left in the tray can be measured – this is the GUD. A lower GUD means that less food was left and the animal perceived the area in which it was eating as less risky. This idea was championed by Joel Brown and Burt Kotler, who have used it extensively in rodent systems and impalas. Thanks for another interesting post. I was unfamiliar with the word ‘kopjes’ until I read your poster presentation and googled it ! Re: poster – very stimulating ideas, this is an interesting direction of research and you do indeed have tons of data to crunch.. I think I’d need a bit more help in understanding what you are showing with Fig 1, unless it’s just that ungulate distribution is not closely correlated with greenness of vegetation. Also, nitpicking I know, in Fig 1, buffalo are shown as residents, but in Fig 2 they have become migrants; and eland, normally considered migrants, have become residents!